This Sekonda stainless steel bracelet combines everyday comfort with distinctive styling. The blue dial is complimented by the sleek blue bezel, inlayed with three sub dials displaying day, date and 24-hour time and accented with silver hands and hour markers. This watch is also functional as it is water resistant to 50 metres. 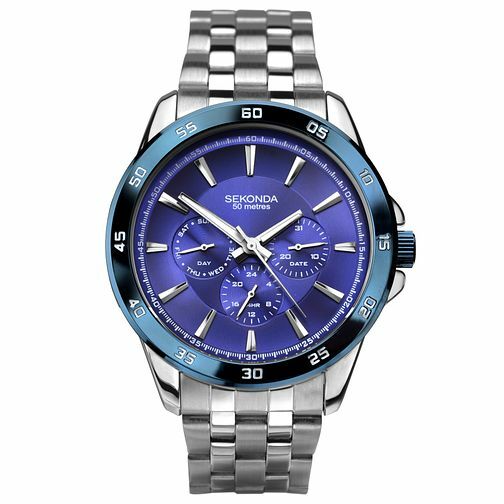 Sekonda Men's Stainless Steel Bracelet Watch is rated 5.0 out of 5 by 1. Rated 5 out of 5 by Anonymous from excellent service Ordered item online after my husband saw it in the store. Delivered exactly when it said it would be,packaged well. Watch is excellent quality and looks much more expensive than it actually was very pleased with item and my husband very happy with his gift.